Many of you will by now have read the letter from Ofsted regarding the monitoring visit to St Peter’s in early November. The letter made many positive comments about the progress being made in the school against the areas for improvement identified in our last full inspection of September 2017. Late on in the letter, a paragraph makes reference to school governors, and their role in holding the school to account for improvements and outcomes in many different areas. The work of school governors is an invaluable way for schools to draw on the broad professional experience of a range of people in order to help the school deliver the best possible results, be they academic, pastoral or professional. The Chair of Governors, Mrs Liz Holdford, is always keen to respond to enquiries about the roles and responsibilities of being a school governor. It is a demanding but rewarding voluntary role to undertake, and governors do play a key role in the effective running of successful schools. As I near the second anniversary of my appointment to the Headship of St Peter’s, I must thank the governors for the professional support and constructive challenge that they have provided me, the leadership team and the school. An equally essential volunteer group from which many schools, but especially St Peter’s, benefit is a parents’ association. Our PTA, known as the Friends of St Peter’s, provide vital support in organising and running school events to benefit pupils and families, all the while raising additional funds to boost the school budget when buying extra resources for the children’s benefit. The Friends of St Peter’s are a great team, and always work tirelessly for the good of the school. You will have read in the November newsletter that the leadership of the Friends is getting ready for a rotation in 2019. There are plenty of roles to fill, not all of them with a specific title lest you are concerned, and the current team will be on hand to advise and support during the transition in 2019. The Friends bring so much to St Peter’s, so any help that families (yes, grandparents, aunts and uncles, not just mums and dads) can offer is appreciated. If you think this is something with which you could help, contact details for Angela McLaughlin are available in the November newsletter. Going to church, en masse! Over the past two weeks, children in Key Stage 2 have had the opportunity to celebrate Mass in one of our local parish churches, Sacred Heart and St Peter the Apostle. The centrality of the Eucharist in the Catholic tradition provides a strength of faith and constancy that holds the worldwide Church together. It is therefore a special and valued opportunity for our pupils to worship at our local church and celebrate Mass together. The Year 3 and Year 4 Mass had as a central theme Remembrance, whilst the Year 5 and Year 6 Mass was based around the power of prayer and the working of the Holy Spirit. Father Jeremy is unfailingly welcoming, and the celebration of Mass is shown for the children as being a joyous and fulfilling experience. It is no mean feat to get over 120 children to church and back on foot, so my thanks must go to the staff of St Peter’s who organise the Masses, to Miss Keogh for providing the music, and to the many parent volunteers who accompany the walking column through the town. Year group Masses in the spring are celebrated in school, but these year groups will again celebrate Mass at the church in the summer term, so all families and parishioners are welcome to join them in May (Y3/4) and June (Y5/6). Remembrance was a key feature to learning and worship at St Peter’s last week as the nation marked 100 years since the Great War Armistice. In the week running up to Friday 9 November, pupils’ curriculum work focused especially on History in readiness for a ‘Deep Learning Day’ on a range of Great War topics on the Friday. To start the History Deep Learning Day, a teaching assembly centred on the work of the Royal British Legion and the significance of Remembrance, noting the fact that well over half of the pupils are in uniformed groups that take part in local war memorial parades and services. The learning focus for the younger years especially was on the power of peace overcoming conflict, and reconciliation being the way to lasting peace. Older pupils in the school worked particularly on the personal experiences of those in the conflict on the Western Front, and how their lives were relayed in letters, poetry and news reports. Each year group got to present their work to the rest of the school in a special assembly. I must thank all colleagues for constructing their learning around the Remembrance theme, and especially Miss Allen for coordinating the History week events. The culmination of Remembrance at St Peter’s was a whole school worship on the Monday after Armistice Day, beautifully led by Mrs Pearson. Alongside the prayers, candles and poems, the most moving part was a reading of The Beatitudes by pupils from Year 6. This was shared in the style of ‘call and response’ for each line by pairs of pupils in different parts of the hall, such that the Word of the Lord was truly circulating within the pupil congregation and throughout the school community. At St Peter’s we often play host to a range of visitors who come to work with our pupils and enhance their learning provision. This week was no exception, with 2 very different guests. On Monday afternoon author Guy Bass came to work with pupils in Years 4, 5 and 6. Having spoken to all of the pupils in the year groups, and thoroughly entertained them with his telling of tales, Guy than had a smaller group of competition winners with whom he worked in an additional session. It is such a treat for pupils to meet the people behind the books they love, and once again Mrs Domblides our librarian delivered a great experience for the children. On Wednesday the school was visited by Sir Robin Bosher. He came to St Peter’s to conduct an Ofsted monitoring visit, assessing the pace and impact of the progress the school has made since the last inspection in September 2017. Once again, the pupils were exemplary in their behaviour and hard work, and Sir Robin complimented the positive attitude of every pupil he spoke to during the day. In due course, Sir Robin will write a letter to the school to summarise his observations and judgements made during the visit, and this will be shared with families as soon as possible upon receipt. 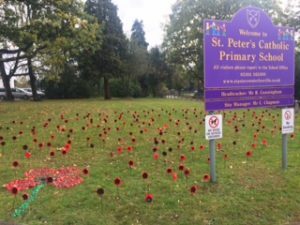 As we approach the hundredth anniversary of the World War I Armistice, St Peter’s is marking the event in a public display of poppies. Mrs Pearson’s cryptic requests for empty plastic bottles have come to fruition in a wonderful piece of installation art at the front of our school grounds. We have a host of poppies standing tall and proud, and a rock mosaic on the grass, as a public testament of our gratitude for all those who gave their lives in global conflicts throughout the twentieth and twenty first centuries. My thanks go to Mrs Pearson, the pupils who painted the poppies and the parents who gave up their time to help construct the artwork. The school has a selection of Royal British Legion items which are available for a suggested donation of between 50p and £1:00, as well as the traditional paper poppies which are available for any amount of donation. The work of the of Royal British Legion with veterans and their families remains as important today as when it was founded in May 1921, and we as a school will do all we can to support their good work.